For the last few days, I’ve been in Harrisburg visiting the man-friend. We have been on the go non-stop! Cut down a Christmas tree, got decorations, and made a ton of food. In the middle of it all, I’ve managed to squeeze in some handstand practice using the tips I learned at the Inversion workshop on Friday. Yesterday I was able to stay up off of the wall for a few seconds! Feels good to make progress. 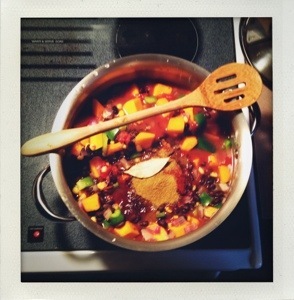 I don’t have much time, but I wanted to share yesterday’s recipe: Butternut Squash chili! It turned out really well, although it could have definitely been spicier. Also, next time I will add Cous Cous, as that helps to thicken it up and give veggie chili that meaty texture you get from ground beef. I found the recipe on Pinterest, but you can find the actual website here. Of course where there is chili, there has to be corn bread, right? Who better to get a recipe from than one Ms. Paula Deen. Check it out! Usually I veganize recipes like this, but since the man-friend already had buttermilk on hand, I decided to use it. However, an easy way to make vegan buttermilk is simply adding 1 tablespoon of apple cider vinegar per one cup of soy milk and let stand for 10 minutes–easy! Time to try my hand at eggplant parm for the first time. I hope you all had a great weekend! What is better than avocado? 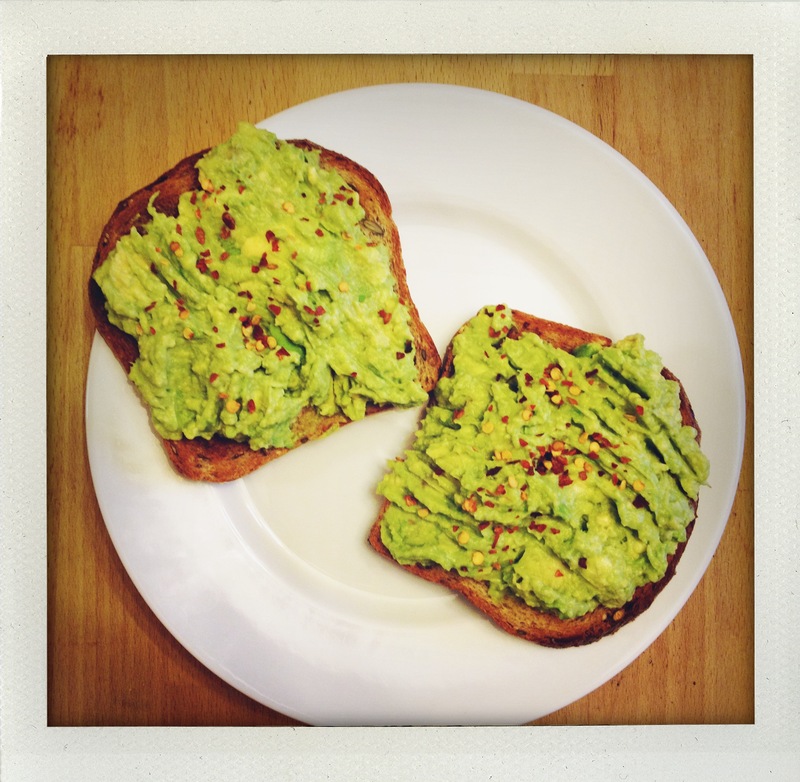 Avocado spread on toast! One of my favorite things to eat is the avocado toast at Cafe Gitane on Mott Street in NYC. 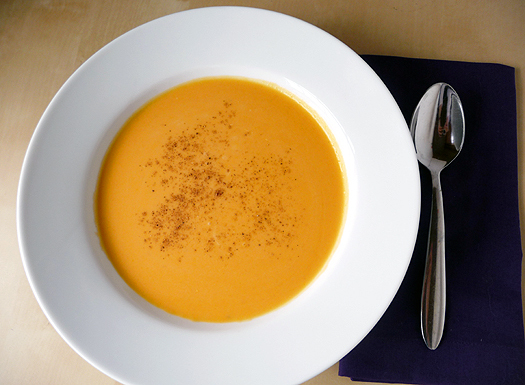 And while I’m lucky enough to work in the neighborhood, this treat is just as easy to make from the comfort of home! Toast the bread. While it’s toasting, peel and pit your avocado. This is done by cutting into the avocado and running your knife all the way around the outside. Twist the avocado and pull open. Using a larger knife, remove the pit by swinging the bottom of the blade down onto the pit (it’s all in the wrist! ), then twisting to loosen it and remove. Use a fork or spoon to scoop out the avocado meat into a small bowl. Mash up the avocado with the fork. 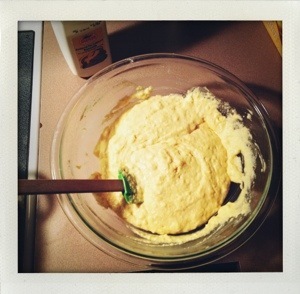 Add the lemon juice and salt and mix. Spread the avocado mixture onto your toast, then sprinkle on the red pepper flakes to your liking (just remember not to touch your eyes after handling the red pepper flakes! Not that I have done this…).